Were You Born to Build? Cultivate the mindset and behaviors of a builder to create economic value and find career security and fulfillment. Jim Clifton, Chairman and CEO of Gallup and author of "Born to Build"
When conversations change to “What are you building?” you will change, and so will the world. Well-meaning and important global institutions, scientists, academics and politicians have never fully understood the rare gift to build something — a God-given natural talent that many are born with — that, to some degree, you yourself possess. Some refer to this gift as “entrepreneurship,” which it is, in part. But this human phenomenon is better characterized as “building.” Entrepreneurship has taken on many definitions, and it’s often confused with innovation. We need a lot of innovation, but building is a very distinct, separate phenomenon. An innovator is first and foremost a creator, an inventor, and a problem solver with a deep passion for improving something. Innovators are thinkers. Economists and well-meaning thinkers often look at a weak or declining economy and conclude, “We have a declining economy because demand is weak or because there is no demand at all.” A more insightful observation is, “There is no demand because there aren’t enough builders who create demand.” Without builders, there is no demand, no growing economy and hence, no good jobs. There was never an inherent demand for cars, flight, TV, video, indoor plumbing, electricity or the internet, or Starbucks or Amazon — somebody had to take a good idea and build it into something big. And when people do that, they create economic energy that wasn’t there before — as well as new good jobs and all the things that build a growing economy. Is it time for you to think about building something? Maybe you could build a small or medium-sized business. Or build a huge business — one with $10 million or $10 billion in sales. They all count and add up to the sum total of the world economy. We need hundreds of thousands of small and medium-sized businesses. All societies need organizations of all kinds continuously starting up and booming — or they can’t develop. You can do this. You could also build a small, medium or jumbo nonprofit. Nonprofits create economic energy too. They boost GDP and create real jobs and real growth in cities and states. So do megachurches, a new children’s museum, a chain of daycare centers, home-health nonprofits or charities to assist disadvantaged citizens. Every one of these organizations or institutions requires a business model and a gifted builder or they will never take off — they will never create new economic energy in the absence of a born builder. You could become an “intrapreneur” too. Intrapreneurs are people who build startups inside established organizations — people who are given hard assignments to start new ventures inside an institution. Established organizations like Gallup will assign someone to “go start a new division that will sell millions of books” or “start a new analytics division” or “start a new center that specifically serves colleges and universities” or “go open a new office in Dubai or Seoul.” These jobs require builders. Builders are made differently than the rest of us. They are born and put on earth to build. Builders from Andrew Carnegie to J.P. Morgan to John D. Rockefeller to Henry Ford famously created historic economic energy through steel, electricity, trains and cars. They transformed America and the world because they created customers that didn’t previously exist. They had a gift to envision, create masses of customers and change how we live. They also made very big bets — they would sometimes bet everything they were worth. Extreme builders will, a few times in their life, bet it all. Every institution in the world — even nonprofits, schools and churches — has customers. Builders are born with a gift to know how to create demand for those customers — market disruptions that offer a better way to live. But creating a big booming enterprise or nonprofit organization won’t happen with just one gifted builder. There is a fragile ecosystem around effective builders. Gallup has found that there are three key players in the development of any organization, whether it’s a new enterprise, a new division within a company or a nonprofit. We call them the “three alphas”: the alpha Rainmaker, the alpha Conductor and the alpha Expert. When this combination exists in an organization or on a team, the likelihood of it breaking out and booming grows exponentially. An alpha Rainmaker has unusual drive and persistence — rare grit. Obstacles and failure actually increase a Rainmaker’s determination. An enterprise virtually never works without this player. An alpha Conductor has management ability. This is the operations person or manager who knows how to get all players on the team — or in the “orchestra” — to work together seamlessly. This person holds the whole organization together. An alpha Expert provides differentiating expertise to the core product or service. Whether it is an analytic services startup’s brilliant statistician, a new restaurant’s star chef or a software firm’s best programmer, virtually every successful startup has an alpha expert who highly distinguishes it from the crowd. The trick is knowing how you fit in. This book will help you determine which alpha role is best for you. It will tell you from which role your God-given strengths will develop most. There is nothing wrong with wanting to build something big and important that makes you rich and famous — or building something that changes the world a little to a lot. There is nothing wrong with wanting to be a significant person in this world who leaves a lasting legacy. It often comes with being a successful builder. 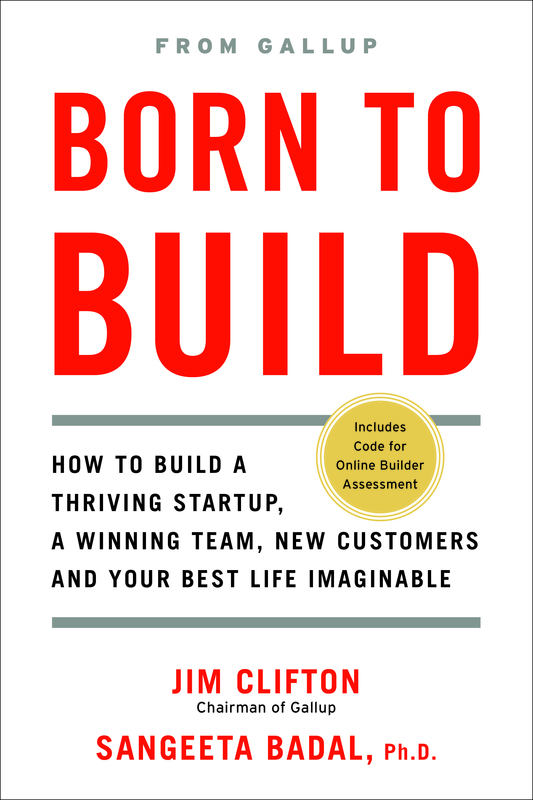 Excerpted from Born to Build: How to Build a Thriving Startup, A Winning Team, New Customers and Get Your Best Life Imaginable by Jim Clifton and Sangeeta Badal. Copyright 2018 Gallup, Inc. Reprinted with permission from Gallup Press. All rights reserved. Jim Clifton is the Chairman and CEO of Gallup and author of "Born to Build" and "The Coming Jobs War." His most recent innovation, the Gallup World Poll, is designed to give the world’s 7 billion citizens a voice in virtually all key global issues. Under Clifton’s leadership, Gallup has expanded from a predominantly U.S.-based company to a worldwide organization with offices in 30 countries and regions. Clifton is the creator of The Gallup Path, a metric-based economic model that links the behaviors of employees and customers to business outcomes. He is also chairman of the Thurgood Marshall College Fund and a Distinguished Visiting Professor at UNC-Chapel Hill and Duke University.